Our position as a general engineering department strengthens our capabilities, enabling multi-disciplinary, collaborative research. As part of our research themes, we work to develop solutions to world-wide problems. Warwick Engineering in Biomedicine goes beyond our Biomedical and Biological Systems group; biomedical research is also undertaken by engineers in fluids, mechanics and sensors. Our Energy Theme brings together a wealth of research into sustainable, clean and financially-viable energy sources and technologies. Sustainable Cities focuses on two main areas: how cities can grow in a sustainable way; and smart cities, using ICT to understand the underlying mechanisms and operational performances. Our Civil and Environmental researchers work on a broad range of issues underpinning civil engineering. Combining modelling with practical experimentation, they tackle issues such as: sustainable housing; dynamic loading of structures; earthquake destabilisation of land; and pollution of waterways. Warwick Ground Engineering group focus not only on the core aspects in geotechnical engineering, such as ground reinforcement, embankment stability of railways or roads, retaining structures, geothermal energy and slope stability, but also on wider cross-disciplinary aspects in geotechnical engineering. Good design is synonymous with sustainable construction and this requires materials and structures research. Current activites focus on the characterisation of components, joints and whole structures of new or traditional materials, and/or of innovative or unusual forms. The largest and most diverse stream, Mechanical and Process Engineering includes: fluid mechanics; fire and explosion hazards; chemical engineering; precision and surfaces; 3D printing; and thermal energy technology. The diverse range of fluid flows in nature and technology span scales (from atmospheric to the nanoscale), phenomena (from cavitation to combustion), constituents (from granular to rarefied), biology (from pulmonary air to microvascular blood) and engineering application (from turbulent-drag reduction to explosion hazard detection). There are many ways to characterize a material surface or an internal structure including its shape, size and mechanical properties. In all such measurements, precise knowledge of the dynamic movement and location of different components of machinery is important. Efficient and sustainable energy development is an ever-present need in the modern world. The need to reduce waste energy in a cost-effective manner, whilst keeping convenience, is a driving force in the work of our STET group. Power, sustainability and improved communications are at the heart of our Electrical and Electronic stream. Key areas of research include: artificial olfaction (or 'electronic nose'); electrical energy conversion; grid-scale energy storage; nanoscale communications; and quantum devices. The Connected Systems Group brings together radio and optical communications and networks, nanoscale communications, embedded computation, and the tight interplay between computation and communication to explore technologies for transforming how we live and interact with modern infrastructure and services, from online processing and autonomous adaptive systems, to secure networks and wireless systems. 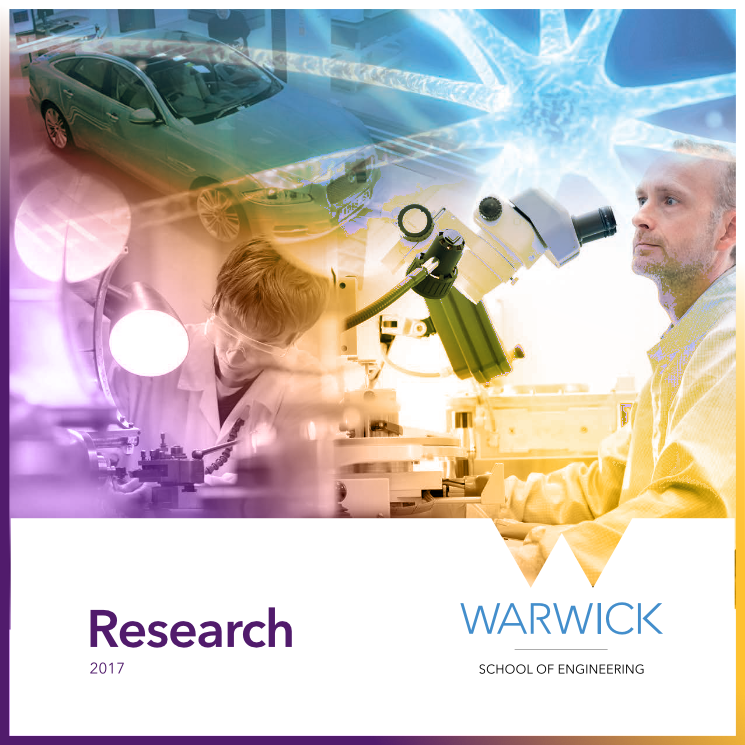 The Electrical Power Research Group at Warwick is set up to conduct internationally leading research and drive for cutting edge technology development in tackling the great challenges in power generation, energy conversion, distribution, transmission and efficient use of energy. The work in sensors takes place within four main laboratories, and consists of cutting-edge research for use in many application areas, ranging from biomedical imaging and diagnosis through to gas sensing and materials inspection. Systems and Information brings together expertise in: nonlinear and stochastic systems; modelling of human activity; neural engineering; telemedicine; imaging; and synthetic biology. Much of the research undertaken is around health and security and the nature of the work means that many labs are cross-group. Our research covers problems in fundamental research of humans, human systems and healthcare are interspersed with very applied projects around the design, development and deployment of assistive technologies and rehabilitation techniques. We focus on computational models and algorithms, the analysis of signal, image and other data, and machine learning; developing fundamental theory and applications relating to the generation, distribution, analysis and use of information in image and video, bioinformatics, health informatics, and optical and wireless communication. Our research into biophysical communication includes biophysical signal propagation, molecular communication engineering and cellular signal processing. Our research includes the identification of complex engineering systems, system of systems in applications to automotive vehicles and chaotic systems - interplay between noise and chaos.